The Day Care arenas consists of three separate classrooms each containing a group of woofers where different activities are carried out. Each group is rotated periodically to ensure that the doggies receive an equal amount of time in each classroom. Our classroom activities include: free play, scent work, relaxing bubble time, one-on-one and group training, plus much more. Measuring at 6,200 square feet, the arena gives plenty of room for the Wags Team to carry out physical, mental and emotional work with our furry friends. The arena has been designed by our experts to give the doggies endless amounts of fun and also to teach good behaviour through positive reinforcement. There is a similar sized outdoor area where the doggies can play and frolic, weather permitting. The salon that we have at Wags ensures that we can send our doggies home fresh and clean after an action packed full filled day at school. If you are interested in your dog becoming a Wags Woofer please fill in our enquiry form and we will get back to you. Fill in Enquiry Form Today! 7-9.30am: Dogs all arriving, outdoor play time and opportunity to go to the toilet. 9.30-10am: Dogs to be grouped into classes. 10-10.30am: Free play in classes, dogs get to know each other. 10.30-11.30am: Activities to start in classes. Classes to rotate into the next section and outside every 30 minutes throughout the whole day. 11.30-12.00pm: Pampered Pooches – time for some R & R, relax those muscles. 12.00-1.00pm: Lunchtime! What’s on the menu? 1 to 1 time. 1.00-2.00pm: Fun and games continue, agility hour. 2.00-3.00pm: Lullaby time, Woofers can drift into dreamland whilst listening to the sound of sweet classical music in the centre. 5.30-6.30pm: Final free play time with furry friends before going home. My name is Archie and I’m a woofer and I keep hearing my mummy and daddy say that I’m a fifteen-month-old Cocker Spaniel. I’m really happy at home but I love going to school at Wags. 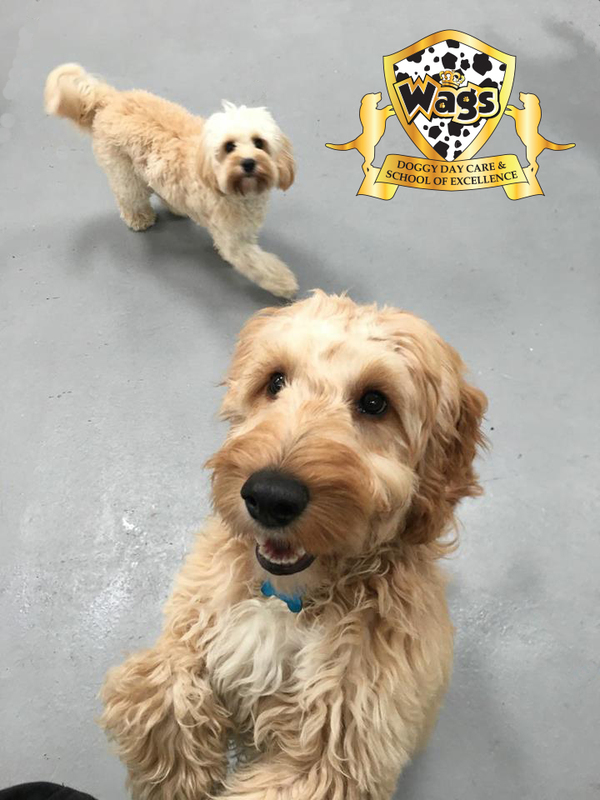 All my furry friends are at Wags too and I just can’t wait to jump out of the car and get into school and then the party begins – yaaaaaaay! As soon as the main door opens I’m itching to get through Reception and I’m always thinking “Hurry up, Mum, and tell Auntie Jane what time you’re picking me up” then I can get into the centre and through to the garden for ‘Toilet Time.’ Bye, Mum! Now I can meet my pals and get some toileting done – always a good move as it means I get a treat straight away. Oh, oh happy days! Next, it’s back inside to be selected for class groups. I’m thinking “Come on, Freddie!” Get into Uncle Alex’s group. He’s a ‘soft-touch’ for treats… I’m not stupid! Oh, oh! I’m going in Auntie Natalie group. That means we have to do some work like re-call or agility. Never mind, I will soon be in the scent section. Wow, peanut butter, oh yesss! Next is the agility section with Auntie Lauren. It’s a bit like PE at schools for humans… Over the jumps, through the tunnels, up the seesaw and then, my favourite, the trampoline. I tend not to listen to the teacher at this point. It’s called ‘Selective Deafness’ but humans are convinced we can’t hear them hahaha! After all this activity, we get the real sleepy time to music again. Turn it on Auntie Emma. I’ve been coming to Wags so long now I reckon I could go on Mastermind with my chosen specialised subject: classical music. I’m an expert on Beethoven’s Fifth, Vivaldi’s Four Seasons and good old Wolfgang Amadeus. It’s funny to watch sometimes cos some of the ‘newbies’ don’t realise it’s sleepy time and they carry on playing hahaha! Then it’s time for Auntie Angie and her troops to step in and this means we get cleaned. Us woofers call them “The Cleaning Brigade.” This is another game to try and avoid The Brigade because when they catch you the brush tickles under your tummy, behind your ears and I’m sorry, I can’t tell you where else – it’s a bit rude! I always feel sorry for Bobbi the Dalmatian at this point because Auntie Angie’s always telling the staff to make sure we are all spotless! Then, when it’s nearly home time, they start shouting all my furry friends’ names out and one by one they all disappear after being sprayed with our perfume CK9. I could pull some serious chicks with this on! I don’t get it… I’m with my girlfriends all day but they spray me at night. Funny creatures these humans! Anyway, home time for me and I know Mummy and Daddy will be in Reception – yaaaay! Need to get my head and ears down now for some dreamland adventures. Oh yeah, I’ve seen a little Schnauzer in there today called Suzie. She’s got a gorgeous tail. I need to check out what day’s she’s in. It’s a hard life being a Wags dog! If you are interested in your dod becoming a Wags Woofer please fill in our enquiry form and we will get back to you.